Last May, as I was just paying off the previous Christmas, it occurred to me that if I was going to spend an enormous amount of money over the holidays I would prefer to give the family something they would actually remember, rather than more stuff for me to trip over and yell about because they aren’t taking care of it. Family entertainment was focused on British television shows such as Dr. Who, Torchwood, Call the Midwife, Mr. Bean, Keeping Up Appearances, and so on. The kids and I got to talking and concluded that it would be a good idea for us to go to Great Britain and check out the locations of our favorite shows in person. My girls wanted to ride the London Eye and I wanted to see the tower in Cardiff where Captain Jack Harkness keeps his monsters (Torchwood). We then relayed our desire to travel to Great Britain to Big Daddy who pronounced London as boring and suggested we go somewhere exciting, like Peru. Okay, then – Peru it is. Research was done, an itinerary was determined, tickets were purchased, and hotels were booked. We were ready for an inter-cultural adventure. We arrived in Lima well after mid-night, managed to make our way through all the lines and inspections and hired a van to take us to the hotel. The city was quiet, a few Christmas lights broke through the darkness and I spotted an ad for “Kraps” crackers (they look like Ritz). Too funny! Cliffs line the coast of Lima and the Pacific sparkles in the morning sunshine. Truly, the view is spectacular. Lucky for us our hotel was just steps away from the coast. Parks line the cliff tops from one end of the city to the other. Each park is themed and the one closest to our Liman headquarters was dedicated to Maria Reiche, the German archaeologist who researched and protected the Nazca Lines, so all the flower beds were shaped like the geoglyphs. A walking path and bike path runs through the parks and people were walking, running, biking and working out at the work out stations all around us. We noticed we were the only chubby people there. 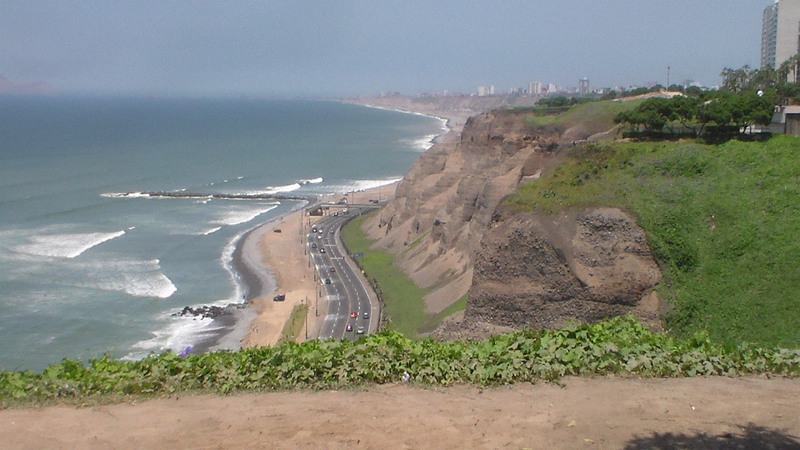 The scenic cliffs of Miraflores, known for its shopping areas, gardens, flower-filled parks and beaches, it is one of the upscale districts in the city of Lima. Following the path south, for about 3.5 km, from Maria Reiche park (I know the distance because the path was marked) we found a remarkable mall called Larcomar. Normally, I wouldn’t call a mall remarkable, but this one is hanging on the side of the cliffs. There were upscale stores there such as UGG and Kipling & Co., as well as Pinkberry and Starbucks, but it’s not remarkable for the shopping (I did have a frozen yogurt and coffee – I had to see if they were the same as here). It is remarkable for the view: only the railing and the breeze separate the shoppers from the sea. In Peru, families traditionally gather on Christmas Eve for the big holiday dinner. The lovely young lady working the front desk at our hotel didn’t want to miss out on having a celebration so she invited all the guests to dine together. She ordered her favorite take out, Pardo’s Chicken (which is basically rotisserie chicken with French fries) and plenty of Inka Cola (very sweet, yellow pop – in Arizona you can find it at Target). This is probably (hopefully) not a tradi-tional Christmas dinner menu, but the sentiment was much appreciated. It was quite a diverse group dining that Christmas Eve: five Americans, one Mexican, one Peruvian, two Chileans, two Venezuelans, and a couple of Brazilians popped in to say Feliz Navidad. Our Peruvian hostess made us Pisco Sours, which were fantastic, and tales of travels along with political discussions lasted long into the night. The day after Christmas we flew off to Cuzco, the Incan capital sitting at 11,200 ft above sea level (twice as high as Denver). Everything I read warned of high altitude sickness, and everything I read was correct! As soon as we disembarked the plane we all got headaches and felt disoriented. Drinking the coca leaf tea helped a little, and over time the disorientation passed, but the headache hung around pretty much the whole time –along with constant breathlessness. The crazy drivers, narrow crowded streets, and constant climbing of stairs also hindered the enjoyment of this ancient city. I think the worst part though was being treated like an ATM machine. As soon as we got to the hotel-before we even got to go to our rooms-we were attacked by a lady trying to sell us tours of the Sacred Valley and Machu Picchu at ridiculously high prices. She worked for the hotel, and I can assure you, reader, that I did not find this high pressure sales situation welcoming. We declined everything except a ride to the train station, and she was visibly ticked off at us. My husband paid her (in cash on the spot) for the ride, and when she gave him the receipt it was for 1/6th of the amount he had given her. Pretty much everyone in Peru, not just Cuzco, wanted us to pay in US dollars, not in Peruvian Nuevo Sols and charged us MUCH higher prices. Service workers in Cuzco were not particularly friendly either – no smiles or friendly greetings at the hotel or in restaurants – tipping is not expected there, so they don’t work for the customers. Don’t even think about getting a refill on a drink, and the only way to get your check is to stand up like you are going to walk out. Of course, we still tipped because we felt too guilty not to. My husband finally just got fed up and started serving himself (and the rest of us). Although we weren’t enamored with Cuzco, the Andes, the Sacred Valley, and Machu Picchu were enchanting. The train ride to Machu Picchu town gives riders spectacular views of the mountains and takes you through small villages and past farm fields that really reveal both the awesomeness and tranquility of nature. 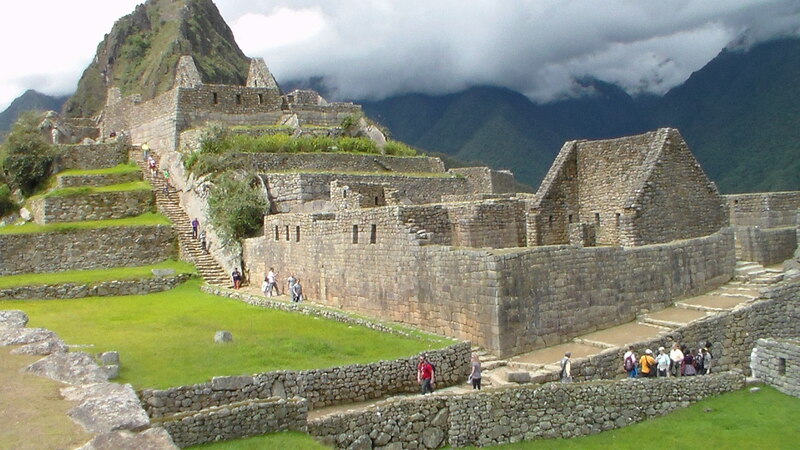 Machu Picchu is an engineering marvel on the top of a super steep mountain. The bus ride up to the ruin was scary, and I kept my eyes closed a lot of the time. Incan masonry is incredible, and the thought of hauling around all the stones to create this city is just overwhelming. Because Machu Picchu is on the peak of a very steep mountain there are many, many stairs (which are also very steep) and no hand railings. There are no nice level paths for people with mobility issues. Expect to use your thigh muscles to the maximum if you go there. The elevation in Machu Picchu is about 3000 feet lower than Cuzco, so it is much easier to breath while doing all the climbing. After resting for a day from our excursion to Machu Picchu, we hired a driver to take us through the Sacred Valley. This gave us the opportunity to get close to the townspeople and visit artisans’ markets. We stopped at a couple of scenic overlooks, and at each there was an Incan family selling crafts and tending a llama or two. My daughters have been making the colorful plastic band bracelets that are all the rage right now, and they traded their handmade bracelets with a little Incan girl for some woven ones that she had made. The indigenous girl was hesitant at first about trading but her mother loved the idea, so did our driver. It seemed like quite a novel transaction for them. 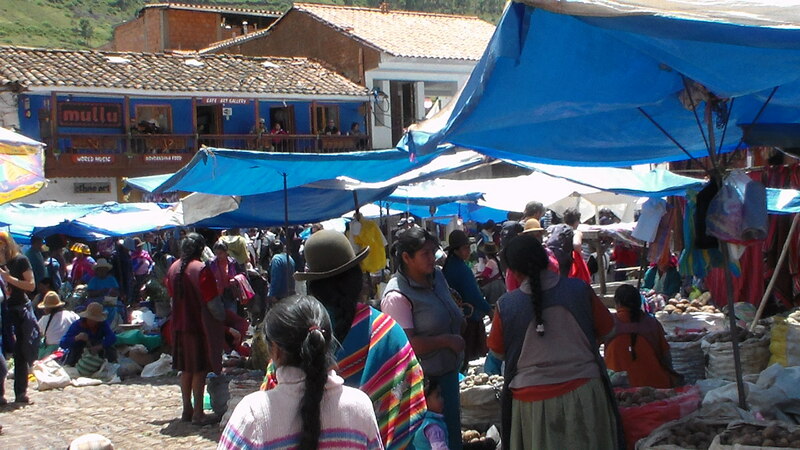 Lucky for us, the day we went to the Sacred Valley was Sunday, and there is a huge market in the town of Pisac that day. They have the regular tourist artisans’ stalls with alpaca sweaters, blankets and shawls, embroidered backpacks and purses, clay figurines and original paintings; but the best thing about Sunday is that the indigenous set up a market to trade amongst themselves. We got to see numerous types of potatoes, glorious vegetables of many varieties, wooden cooking utensils (why didn’t I buy some of those? ), fresh fish, giant onions, beautiful flowers, and all manner of everyday necessities. We dined in the street on Incan corn (which has kernels the size of nickels but twice as thick with the starchy consistency of a potato) and cheese empanadas (empanadas are pocket sandwiches). Pisac was definitely one of my favorite places in Peru. Pisac market, a Peruvian village in the Sacred Valley on the Urubamba River, is well known for its market every Sunday, Tuesday, and Thursday, an event which attracts heavy tourist traffic from nearby Cusco. Returning to Lima, we had a little time to explore the old part of the city. We visited the church of San Francisco that has catacombs, and saw the bones of at least 25,000 people who had been buried there starting in the 1500s. That was pretty cool. Naturally, we found a tourist market and spent plenty on Peruvian hats, shoes and other goodies to remember our trip. There was a little restaurant near the market that was advertising cuy as the special of the day. If any readers watch Bizarre Foods, they will know that cuy is guinea pig. 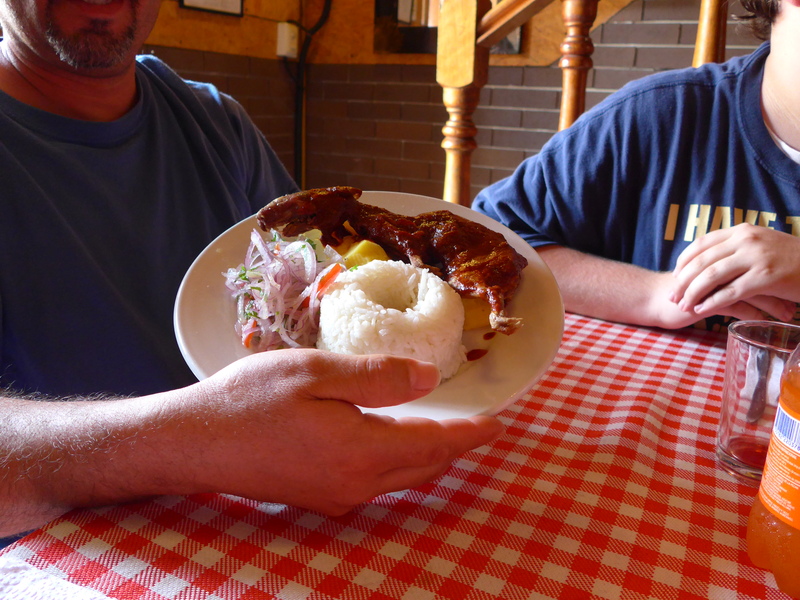 Ever since we decided to go to Peru, we looked forward to the opportunity to eat guinea pig, and here it was. My daughters both ordered the special and were very excited, until their plates came. The cuy was just a little too realistic. Basically, it looked like half of a rat on a plate hugging some rice. Yes, it was cut in half, long-ways, head still on, legs and claws lying on top of the rice and covered in a red sauce. It made me nauseous. My younger daughter tried some of the meat (there is hardly any) from the thigh area, but my older daughter wouldn’t touch it. I tried some of the meat as well, and to be honest, I can’t remember what it tasted like because I was still so horrified by the presentation. The next day, we walked across Miraflores to see a pre-Incan ruin called Huaca Pucllana. This HUGE platform mound made of clay bricks had only been discovered about 30 years ago. Even the Inca did not know it was a man-made structure because it had already been reclaimed by nature and covered in dirt when they arrived in Lima. It is really an awesome structure and designed to withstand earthquakes by placing the bricks vertically and leaving space between each. There is also a fancy restaurant on the site, and my mom decided we were going to eat there (maybe to recover from the cuy catastrophe the day before). It was delicious! Many people had told me Peruvian cuisine was wonderful, but this restaurant was over the top (and they refilled your drinks). With more time and money, I would have liked to fly over the Nazca lines and visit the frozen Incan mummies in Arequipa, but all in all I think we had a pleasant little exploration of the Peruvian culture and landscape.